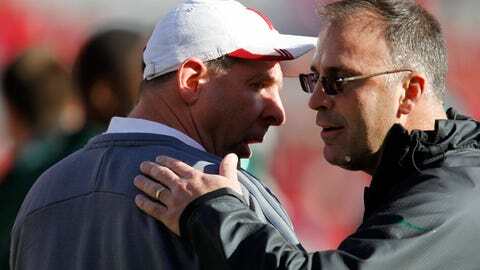 On Tuesday, Narduzzi (right) won the Broyles Award, given each year to the top assistant coach in college football. There’s a reason the Michigan State Spartans seemed to get a boost of energy in the fourth quarter of the Big Ten championship game. His name is Pat Narduzzi and he’s the intense assistant head coach/defensive coordinator of the No. 1 defense in the country in the Football Bowl Subdivision. On Tuesday, Narduzzi won the Broyles Award, given each year to the top assistant coach in college football. Narduzzi beat out Auburn offensive coordinator Rhett Lashlee, Baylor offensive coordinator Philip Montgomery, Duke offensive coordinator Kurt Roper and Florida State defensive coordinator Jeremy Pruitt. Narduzzi received the award at a luncheon in Little Rock, Ark., which honored the five finalists. "It is a win just to be here for this," Narduzzi said to reporters in Little Rock. "To be a finalist, it means so much to me." MSU coach Mark Dantonio said he appreciates everything Narduzzi has done to help the Spartans reach their goals of winning the Big Ten and making it to the Rose Bowl for the first time since 1988. "It’s a well-deserved honor," Dantonio said in quotes released through MSU football’s Twitter account. "Pat pays great attention to detail and he’s an outstanding teacher. His relationships with his players also is a strength. In addition, he’s an outstanding recruiter. Pat has been a loyal staff member for 10 years, including the last seven years at MSU. "As our assistant head coach, he’s asked to manage a lot of duties. Pat has been the architect of a top 10 defense for the last three years. The fact that five of his players earned first-team All-Big Ten honors speaks to how dominant his defense has been this season. There’s no question that his defense has been the cornerstone for this record-setting 12-win season." Sophomore defensive end Shilique Calhoun talked about Narduzzi’s impact when he left the press box to come down to the sideline last Saturday. "When Narduzzi comes down to the field, you know you have to get the job done, there’s no ifs, ands or buts, you’re gonna get your job done," Calhoun said. "When he comes down, he brings a lot of passion, his passion for the game is amazing to where it inspires you to where I gotta do my best. He’s watching. You don’t want to let him down because you know that he’s watching. "You understand how much hard work he puts into watching film or putting us in the right position, so when he comes down, it’s like no other. You see the passion and drive and it just pushes you to keep going, to get your motor going. He came down in the fourth quarter and we got going." Now the Spartans want to make sure Narduzzi doesn’t go anywhere as he’ll no doubt be a top candidate for a head coaching job after the bowl season is over.